Why did Jesus feel the need to repent? I recently attended a church service, where the Gospel reading was the story of Jesus’ baptism by John in the Jordan river. The preacher noted that John proclaimed that his baptism was a sign of repentance for the forgiveness of sins, and, in passing, commented that because Jesus was without sin he would have had no need of John’s baptism. He is not the first to be puzzled as to why Jesus felt the need to be baptised by John: Matthew in his Gospel was equally puzzled. I understand the confusion: if you are thinking of Jesus as the Cosmic Christ or the Risen Lord then you might well think of him as being without sin. [see my article ‘Which Jesus’] But it seems clear that the man Jesus of Nazareth did feel the need for John’s baptism as a sign of his repentance, and I wonder what it was that he needed to repent of? The Gospels don’t tell us, so ultimately we’ll never know, but I find myself intrigued by the question. Jesus often taught people by telling them stories. I wonder where he got the ideas for his stories? Some appear to be derived from images in the Old Testament, like those about a vineyard. Others seem to have been drawn from everyday life in Galilee, like those about a sower, the giving of a party, a shepherd searching for a lost sheep, or the gathering of crops at harvest. But in my experience the best stories are often derived from personal experience and I wonder if some of Jesus’ stories might have been? The story of his baptism, which only he could have told, must be one but I wonder if there might be more? I am thinking of two other stories that stand out for me, because they are seem more focused and detailed than the rest. I remember, many years ago, reading the suggestion that the story of The Good Samaritan’ may have had its origins in an event that happened to Jesus himself: that he had been attacked and beaten up while on the road between Jericho and Jerusalem, and that it was his experience of being ignored by religious people whom he’d expected to help him, and looked after by a man whom he’d viewed as his enemy. that caused him to rethink his views about who his neighbour is. The suggestion was that eventually he told the story in order to challenge the conventional view about who was one’s neighbour, hoping that what had changed him might well change others too. As indeed it has. I find that suggestion very plausible. Not least because there is at least one other story in the Gospels that tells of how a personal experience persuaded Jesus to change his mind about a conventionally held view. I refer to the story of the Syro-Phoenician woman who begged for Jesus to heal her child and whom Jesus initially refused to help because she was not a Jew, until her persistence changed his mind. Again it was a foreigner who was the catalyst, and in this case a woman. The Gospels tell us that Jesus was often surprised by the faith shown by foreigners, and even remarked that they showed more faith than his fellow Jews. It seems that God taught him things through them that he hadn’t learnt from his Jewish inheritance. It was while I was pondering the preacher’s words about Jesus having no need for John’s baptism of repentance, that I found myself drawn to his story of ‘The Prodigal Son’, and suddenly the lights came on. Again it’s a story with quite a bit of detail, it has no obvious Old Testament antecedents, and its unlikely to have been an everyday occurrence in Palestine. Might this also be a story from Jesus’ own experience? Might it be that he had left home as a young man taking with him his share of his inheritance?, that he subsequently squandered it and so had to undertake the ritually unclean work of looking after pigs owned by a non Jew, before coming to his senses and returning to his father where to his surprise he found forgiveness and a celebratory welcome he had not anticipated? Clearly this is conjecture, and we’ll never know what the origins of this story actually were. But again it does seem plausible to me, and it would make sense of a number of other things as well.
. Crucially, it could explain why Jesus felt the need for the repentance offered by John’s baptism. He had received his father’s forgiveness, but his behaviour had resulted in him being ritually unclean and he no doubt felt the need for God’s forgiveness too.
. The words that God spoke to him at his baptism ‘you are my beloved son, in whom I am well pleased’ could easily be imagined as the gist of what the father said to the returning prodigal. The message is likely to have been the same. If so, it would be overwhelmingly powerful for Jesus to be received and welcomed by God in exactly the way his earthly father had received him. It could be the reason why he spoke of God as ‘Abba’, a Jewish child’s familiar name for its father. No wonder he had to go away by himself into the wilderness to ponder the implications of this. Was what he had learnt to be true for him also true for others too? And if so did his Heavenly Father want him to share what he’d learnt ? Was not this the essence of the Good News of God’s Kingdom that he left the wilderness to preach about?
. It could lie behind Jesus insistence that we sort out our personal relationship problems before asking for God’s forgiveness, because that had been his experience.
. It might explain why Jesus consistently sought out those whose life experience left them as outsiders in the Jewish community, and his concern, in God’s name, to include them. By his behaviour he had made himself an outsider, but he had then found himself graciously accepted, included and affirmed.
. It might lie behind his realisation that humans are not made unclean in God’s sight by external matters like working with pigs, but only by what lies in the human heart.
. It might lie behind the visit Jesus made to the country of the Gerasenes, where he cured a man and sent the evil spirits that had possessed him into a herd of pigs. Maybe this was where Jesus went when he left home, maybe he knew this herd of pigs, these people, and this man who was possessed. Maybe that was why he felt the need to go there?
. It might also in part explain those scenes in the Gospels when Jesus’ family clearly think that he’s not in his right mind and want to take him away, and which lead to him disowning them, ‘Who are my mother and brothers?’ If Jesus had behaved like the prodigal son it is easy to see that this might not have gone down well with the rest of his family, whatever his father might have thought, and especially his brothers. And if he then capped that by claiming a religious experience at his baptism, in which God also delighted in him as His beloved Son, you can see how they might have been concerned.
. It rehabilitates Joseph from being a peripheral figure in Jesus’ story, to being a vital & central one. Certainly as important as Mary.
. Jesus whole life-story becomes a powerful example of the truth that ‘nothing can separate us from the Love of God’, not even what looks like failure and humiliation. In that it prefigures Jesus’ death and resurrection.
. It becomes not just a piece of abstract theological truth but the direct consequence of Jesus’ lived experience.
. It encourages us to treat our own experience as one of the most powerful ways through which God can and does speak to us.
. More: an acknowledged sense of failure has the potential to be the best thing that’s happened to us. And beware those who seems to have no acknowledged sense of failure. As I’ve said, this is all conjecture. There are alternative hypothesises which could explain all the points I’ve made, but they’re conjecture too. We will never know the truth of it. But the question of why Jesus went to be baptised by John remains intriguing, and surely merits exploration, not least because it challenges many of our assumptions about Jesus. So I apply the criteria ‘If this is true does it enhance and deepen my understanding of Jesus? And does it deepen and enhance my own relationship with God? For me the answer is ‘Yes’ to both, and so I intuitively sense that there is truth in it. I went to the desert. It was not entirely what I expected. Arizona. To start with there was more vegetation, though different from what I am used to: scrubby, survivors. Then there were always mountains in the distance, seemingly, never to be reached, forever at arm’s reach… Then Tonto – Sedona – the Grand Canyon. I loved it all. The vastness of it has undone something in me. Pulled the rug from under my feet. Cut me down to size. Cast me adrift. … Choose your cliché. Clichés are only clichéd because they tell a truth. I am disturbed. I miss it. I haven’t yet come to ground. I long to be back there. What name have I remembered? The world is big; I am little. Every which way I looked, every way in which I looked, there was an expanse I was unable mentally to fathom. I encountered four dimensions of ‘vast’. The first was the flat, almost featureless, extent of sand and scrub. A first glance showed a landscape uniform in all directions: each bush as alike as its neighbour a few feet away; each unmarked and unremarkable hole remarkably alive with ants determinedly about their business. But here’s the thing: each bush and ant colony is a world in its own right, each as important as the civil, dear-to-me world I inhabit. The second dimension of largeness was driving up a mountain to the pass and looking down at the terrain – or fetching up on the south rim of the Grand Canyon, 10 miles to the north rim and a mile down to the Colorado River. Neither wideness nor height and depth was new to me. The globe itself is great, but the human project has managed to encompass it in all but the most inaccessible places. America is not tamed, but it is traversed, by track, tarmac, pylon, and radio waves. People are amazing, ingenious, inventive, dauntless but our apparently unassailable longing for significance and immortality is destructive, and will, ultimately, be fatal. I gained the third perspective coming upon numerous settlements, from a few dwellings to cities of millions, in the ‘middle of nowhere’, on the shores of a lake, or the confluence of rivers. It struck me that each collective contained people mostly engaged in the same endeavours – building a life, a family, a home, making and selling (though more selling than making), getting and spending, constructing a set of friends and colleagues, real and virtual – all conferring the semblance of significance. Repetitive; imitative. I knew nothing of them, nor they of me, but our lives were largely interchangeable, and unremarkable, I fancied. What tugged most insistently at the construction of Pick-up sticks of what I fondly like to think of as mylife was the time-scale revealed in the geological calendar of the Grand Canyon. I learnt that the canyon has been carved by the Colorado River over the course of 5 to 6 million years. That’s a long time. However, it turns out that the layers of sediment were laid down over a much longer time-scale. Standing on the southern rim of the Grand Canyon, I could look back in time, scanning down through the strata, terracotta and tan, disintegrating and dusty, to where the river runs now, deep and hidden, on rocks that are 1.8 billion (1,800,000,000) years old. Now that really is a long time. It is 6,000 times the current extent of the Homo sapiens project. It exposes my 60 years to a new perspective. I regret missing the opportunity to look at the stars from a place relatively free of light-pollution. There, finally, is the unfathomable, unplumbable, and unimaginably vast. What is the name I have remembered? I have remembered that I am not important; that I am a small thing on a small, blue planet; that I am not all this worry about mylife, mydecisions, being liked and valued, being safe, having control. I know my name is not all this. What is my name, then, if I have one? What is my significance, if any? What are we for, if anything? I have no answers. I find no resolution between longing for significance and the feeling of disappearing into a perspective, like the vanishing point of railroad tracks, that I cannot get my head around. It is difficult to convey in these words the deep, disturbing delight, the delightful disturbance, of these questions. It is crucial to understand this: yes I am disturbed, but the delight, the relief, the gratitude! I loved the desert and the vastness in space and time. I want to be there. I want to know that what I fondly think of as “I” doesn’t much matter, when push comes to shove. I have no future. I have no past. When all is taken away one thing remains. All I have is now. My name is “now”. The only viable response to the vast beyondness of things is being fully present to the moment, this moment. My name is “one who breathes”. In a breath, felt from the nostrils to the belly, breathed with and into the heart, is the whole world, eternity, You. The things that ignore us save us in the end. Their presence awakens silence in us; they refresh our courage with the purity of their detachment. Psalm 34 verse 5 tells us to ‘Look to the Lord’. St Clare of Assisi tells us to ‘Gaze upon the Lord’. 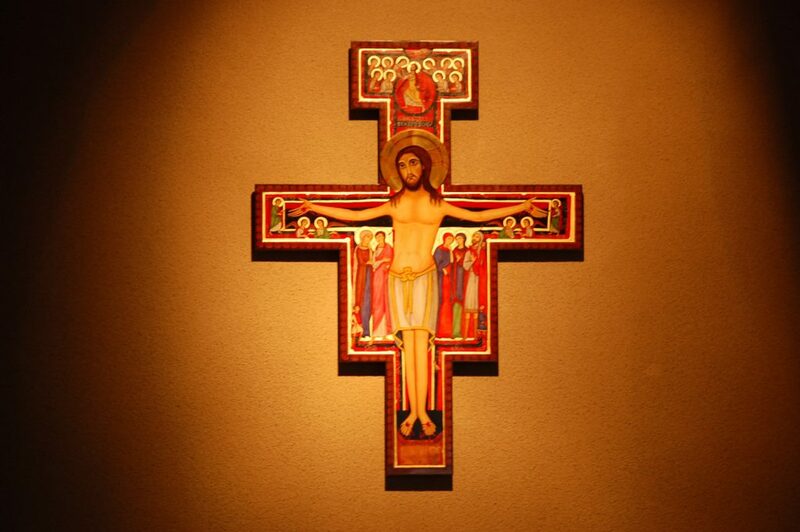 Using the image of the St Damiano Cross as a starting point for our reflections, we will consider what it might mean to cultivate an attitude in life of ‘looking to the Lord’. In the middle of Lent, this day provides a space to help prepare for the coming of Passiontide and Holy Week. It’s a painfully familiar cry. Every time I hear it I know that something nasty, maybe even ‘evil’, is being proposed: placing all the blame for something, on one person, or group of people, for if we can only get rid of ‘them’ then the problem will go away. Hitler did it to the Jews. Many today, like Mr Trump, are doing it to immigrants, as nationalists everywhere, are prone to do. Its never true of course, but its a simple way of placing responsibility for an uncomfortable issue, on someone else, so that we can avoid our own responsibility for dealing with it. Its called ‘Scapegoating’ and the individual or group scapegoated are Scapegoats. There’s always a nasty smell in the air: massive injustice lurks and is about to be perpetrated on somebody, somebodies, who are deemed to be vulnerable and disposable. As I said, its not an image that I find at all helpful for Jesus. Its an image for an action which most of us can see with hindsight to have been abhorrent. Yet it continues to be recognisable in all walks of life, from the personal to the public. Even the church has a line on it: the Roman Catholic Church is currently coming under fire, and rightly so, for the abusive behaviour of some of its priests, and the church is punishing the guilty ones. But the real responsibility, it seems to me, lies with the institution itself, which demands that all priests be celibate. A demand that makes the abusive behaviour all but inevitable. Rather than acknowledge that and reform itself the church scapegoats the expendable individuals. Society at large is little better, many of those languishing in prisons, in poverty, or in deprivation are being punished by society for it’s failure to care and provide adequately for all of its members. Sadly, we seem to be less skilled at recognising it in the present, especially when we ourselves are doing the scapegoating: whether its individuals, groups, nations, religions or races who are involved. And of course, its always those judged to be weak and vulnerable who are picked on, rarely the powerful.